Dolphins intrigue, interest and captivate me. And I don’t think it’s just me; the sight of a dolphin at sea or offshore sends everyone running to look. Perhaps it’s the intelligence and grace of the dolphin, paired with the mystery we only barely understand under the ocean’s surface. Whatever it is, I’ve been thrilled this year to see greater numbers of dolphins in Eleuthera’s waters than ever before. Over the years I’ve seen more dolphins off the U.S. Gulf coast than I have in the Bahamas. There was one time we went out off the coast of Savannah with an accomplished fisherman. He went out daily and had gradually gained a pod of dolphins’ trust. 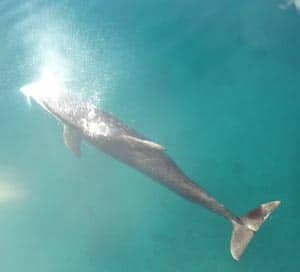 As we motored slowly to a particular area of the sea, an area that looked no different than any other, suddenly the curved dorsal fin of a dolphin could be seen zipping through the murky brown water. He (or she) was joined by several more dolphins, and they encircled the boat, whistling and clacking. The fisherman reached into a bucket and gave all of us three to five inch bait fish. We took turns holding them over the sides of the boat and the dolphins took them from our fingers. I even gripped the tail of a fish in my teeth and a dolphin gently snatched it away. It was like Marine World, or whatever that place is called in Florida, except not scripted, and punctuated by the dolphins’ freedom. We would occasionally see dolphins in the Bahamas when we had our 46’ Grand Banks trawler. The most memorable experience was crossing from South Eleuthera to Cat Island. For whatever reason we stumbled across dolphins on somewhat of a regular basis in that stretch of water. We were bobbing across the deep blue water when we spotted a couple of dolphins who had caught our bow. We slammed the twin diesel engines into neutral, grabbed our snorkeling gear off the deck, and jumped in the clear cool water. The dolphins were as curious about us as we were about them, and for a few precious minutes we dove and circled in tandem. It was truly magical. As quickly as they came they were gone, and we were left to madly swim after our cork of a boat drifting with the tide. Last year we had a few minor sightings of dolphins off Eleuthera. We’d had a lot of problems with our 23’ Boston Whaler’s motor and it seemed we were stranded or dock-bound more than gliding across the sea. After we finally got the motor fixed, we took the boat out for a sort of test/victory run. Two dolphins appeared from nowhere and led us into Governor’s Harbour. They leapt and raced and glistened in the noontime sun. It was spiritual and meaningful on a level that had nothing to do with religion. But this year…this year is different. We had looked in vain for dolphins the first day we were out on the boat. We were accompanied by a prescient eleven year old French boy named Theo. Theo wanted to see a dolphin more than anything. He asked all kind of questions about them, “what do they look like?” and “what color are they?”. Disappointingly we saw no dolphins. We docked the boat and went back to the house. A couple of days later it just so happened that all of us, seventeen of us, were on the beach in front of the house, on the Atlantic side, where I’d never seen a dolphin before. Suddenly Theo said “Look!” and there were two dolphins, maybe ten feet off the beach. They were looking at us and we were looking at them. It’s hard to say which mammal was more curious about the other. We maintained our mutual inspections for several minutes while some of us ran around looking for a camera or fins or a mask. Someone else nearby clattered into the ocean in pursuit, and the dolphins scooted away, disappearing into the darker, bluer water, out of reach. Theo went snorkeling for the first time that trip the next day. It was his last day on the island. The same two dolphins found him and darted around him, one loitering more in the background, watching the younger dolphin play and learn. It was an unmatched experience. It captures ones imagination as to how the dolphins knew that Theo was safe, that Theo wanted to learn about them as much as they wanted to learn about him. There is a shared magical communication that binds perceptive humans with dolphins. We’ve seen those same two dolphins (or maybe another two, it’s hard to say) several more times off the beach. One time they followed a Bahamian walking home from work via the pink sand avenue. We watched from a distance, elevated up off the dune on our deck, and they mirrored her walk from the sea. Another time horses and their riders were sauntering down the beach, a somewhat daily experience thanks to the newly opened Oceanview Farm up the road. The dolphins appeared from nowhere and tracked the horses. Riders and horses entered the water, and the dolphins came close enough to check them out. What did they think of the horses? What did the horses think of the dolphins? Did they communicate with each other? I’d love to ask the horses or the dolphins and hear the answer. Hopefully they are not as clueless as the majority of humans. I’ve read that dolphins are territorial. They can live to be fifty years old, and they integrate into their pods much as humans mature within their families. They grow and learn as juveniles and then have baby dolphins of their own. The grandparent dolphins babysit and dote. One of the only natural things (man’s inhumanity or carelessness doesn’t count), that will move or separate a pod of dolphins is a hurricane. There have been two in the last year and a half—Irene in August of 2011 and Sandy in October of 2012. Perhaps it was these tumultuous events that deposited more dolphins in our waters than ever before. Or perhaps it’s my karma that’s allowed me to glimpse their hidden world this year. The author Douglas Adams’ fourth book in his humorous science fiction series “Hitchhiker’s Guide to the Galaxy” is, in part, about dolphins leaving the planet earth. The dolphins take off in spaceships before earth is demolished to make way for a hyperspace bypass. It’s been a while since I’ve read it, and I don’t remember much more about the book than the aforementioned vague plot synopsis. But it’s the title that’s always intrigued me. The title is the dolphins’ final parting words to mankind. The title implies that we are here for the dolphins, certainly not the other way around. The dolphins escape with their lives as mankind dies. The title is “So Long, and Thanks for all the Fish”. Great piece, Katie. Thanks so much. I remember watching dolphins play in our bow wave when I was on an aircraft carrier. We would go out onto the deck-edge elevator when it was lowered so we could get a better view. We were on Cape Breton Island last fall and went out on a whale-watching tour. No whales but beautiful scenery. Hey Katie! What a lovely ODE TO THE DOLPHINS! I was 5 weeks in EL during Jan & Feb and from our balcony on the Caribbean side, I saw a lot more dolphins as well. Or at least the water was calm enough to really notice them more readily. We call those times with “mirror-flat” water, the dolphin days! What a joy to read this just a few days after returning from Eleuthera. It made me miss the island very much, and reminded me about some of the things I love about it. And think about some things I haven’t experienced there yet, like the Dolphins. Lemon Sharks, yes, but no dolphins. Looking forward to returning soon. Thank you! Thanks for sharing these magical stories and sending that dolphin energy, vicariously, up north! What a wonderful story Katie, even though I am very late to this party. Hope you are doing well!